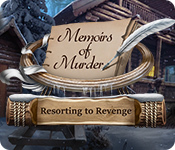 January 17th, 2012 by Margie B. in Walkthroughs. This document contains a complete Fear for Sale: Sunnyvale Story game walkthrough featuring annotated screenshots from actual gameplay! 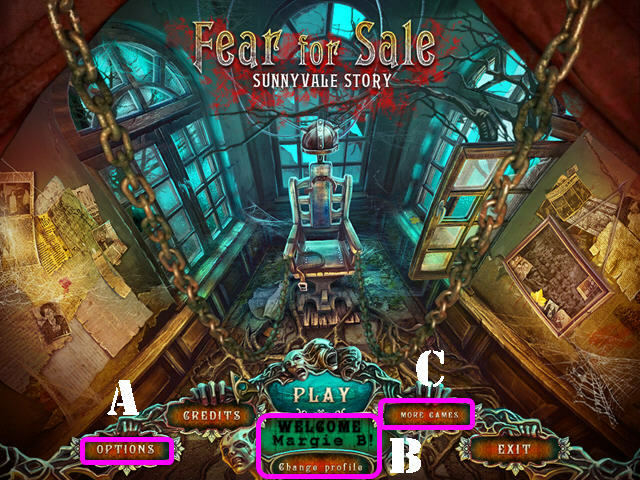 This is the official guide for Fear for Sale: Sunnyvale Story Standard Edition. The Options (A) Button allows you to adjust the screen size, music, cursor, and sound. The ‘Change profile’ button (B) can be used to manage your profiles in the game. 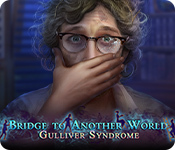 The ‘More Games’ button (C) shows you other games by this developer. 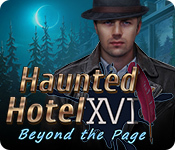 There is a Journal located in the lower left that will be updated as you play; it will sparkle with every update. 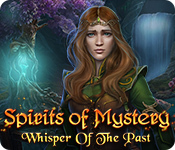 All mini-games can be skipped once the skip button has recharged. 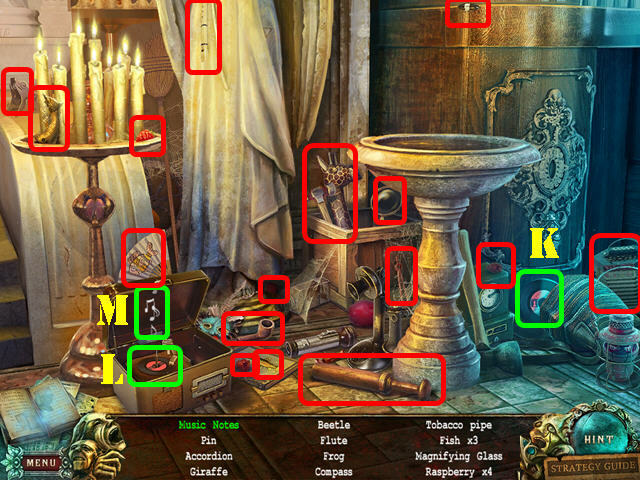 This guide will refer to Hidden Object Scenes as ‘HOS’. The lists in HOS are random. 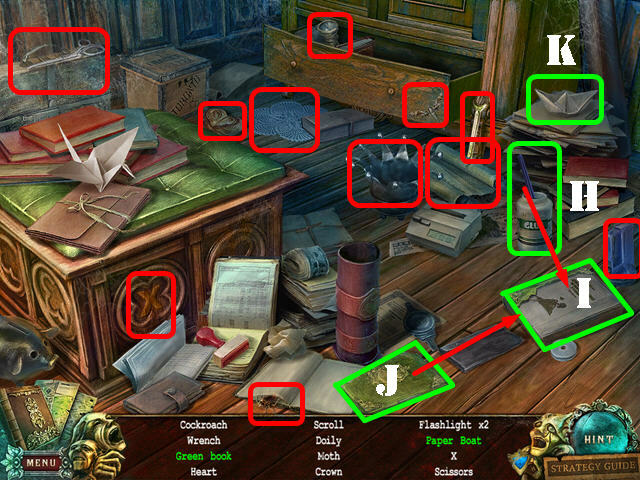 Items written in green in HOS require an extra step before they become visible. If you place your cursor on a character and the cursor turns into a dialogue bubble, it means you can speak to them. Your cursor will change to an arrow when you can head to another area. The hints are unlimited but you must wait for it to recharge between uses. 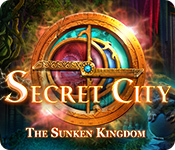 Excessive random clicking will cause you to lose control of your cursor for a few seconds. Use the arrows on either sides of the inventory bar to scroll through your inventory. Move your cursor to the bottom of the screen to bring up the inventory bar. Talk to the mayor (1). Take the INSULATING TAPE (A). 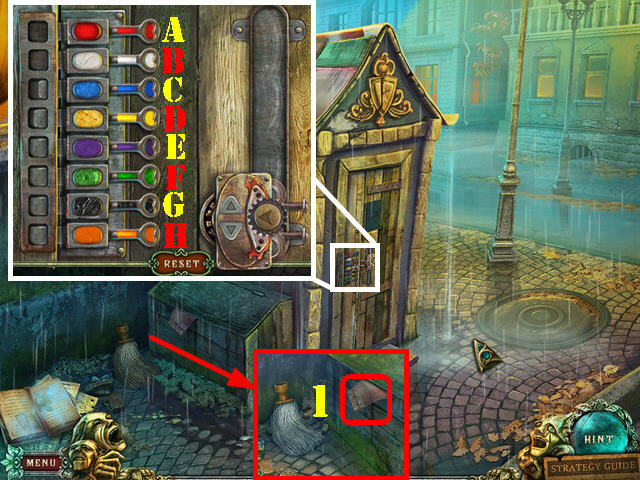 Examine the fence; take the MILL INLAY (B); click on the paper twice to add a journal page clue to your journal (C). Go through the door; talk to the sheriff. Examine the body on the ground; take the WOOD BEAM (D). 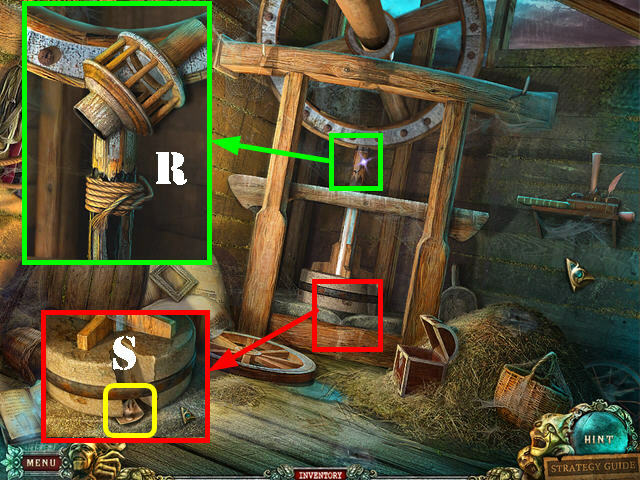 Zoom into the door; put the WOOD BEAM on the millstone and click on the beam (E). Click on the paper 4 times; take the paper plane (F). Remove the cork (G); take the glass with water (H). The GLOW STICK will be added to inventory. Take the WHITE LINEN (I) and the ROPE (J). Click on the stack of hay twice; zoom into the chest and take the HOOK (K). Put the MILL INLAY on the lock (L). Click on the lock; remove the sheet and take the PITCH (M). 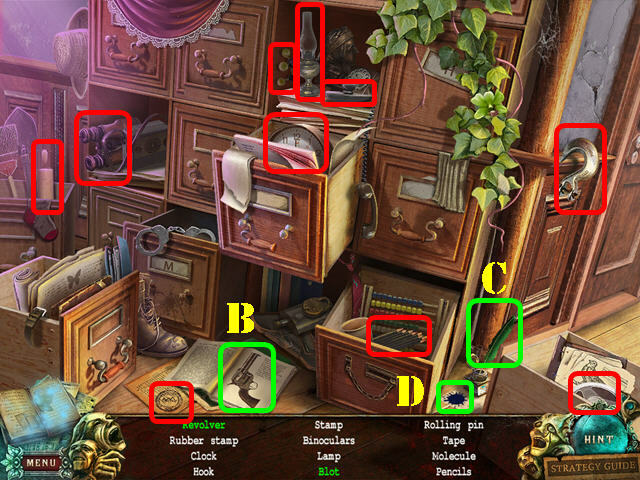 Examine the shelf; take the journal page clue (N). Place the GLOW STICK in the well (O). Click on the rope; attach the HOOK to it (P). 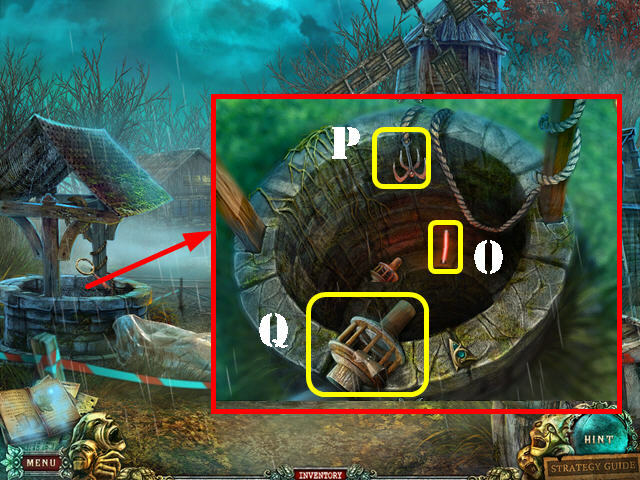 Click on the hook to attach it to the item in the well. 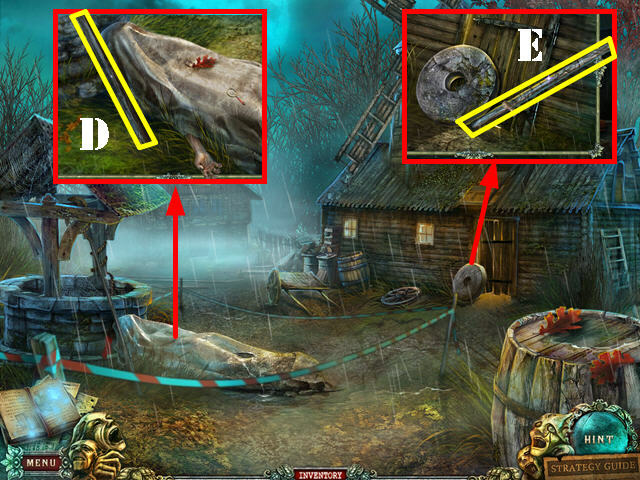 Click on the hook again and take the MILL GEAR (Q). Go back into the mill. Zoom into the top of the shaft and click on it (R). Use the PITCH on the shaft. Wrap the ROPE around the shaft. Place the MILL GEAR on the shaft. Zoom into the bottom of the shaft; take the PHOTO (S) after you click on it several times. Give the PHOTO to the mayor. Go towards the right after the policeman and the mayor disappear. 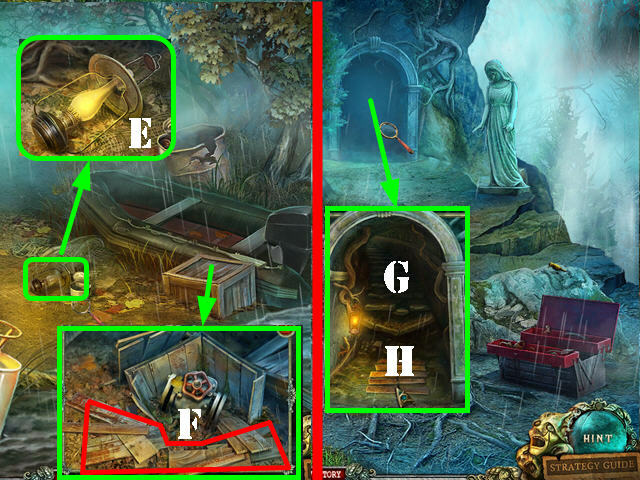 Examine the base of the statue; take the SLIDE (T) and the journal page clue (U). Zoom into the paper by the grate; take the journal page clue (V). Remove the leaves; take the LENS (W). Go towards the center building; talk to the sheriff. 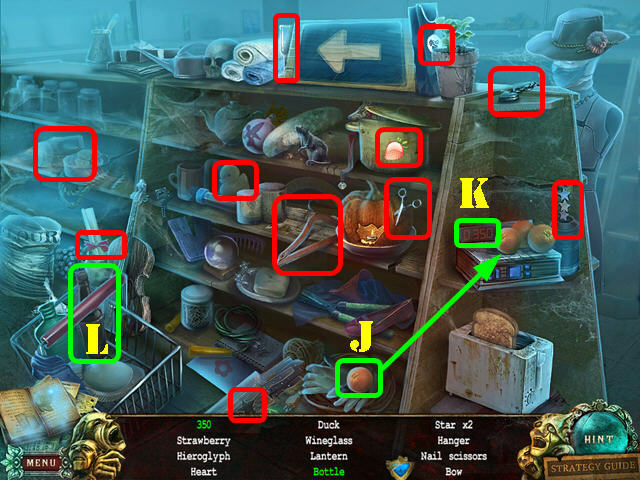 Examine the post; take the journal page clue (X). Click down twice and head towards the center building. Zoom into the rain spout; take the GREEN KEY (Z). Walk down and go towards the guard’s hut. 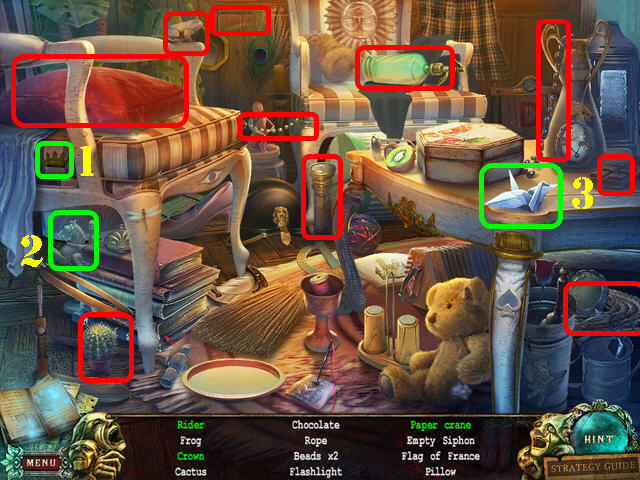 Zoom into the mop head; take the journal page clue (1). 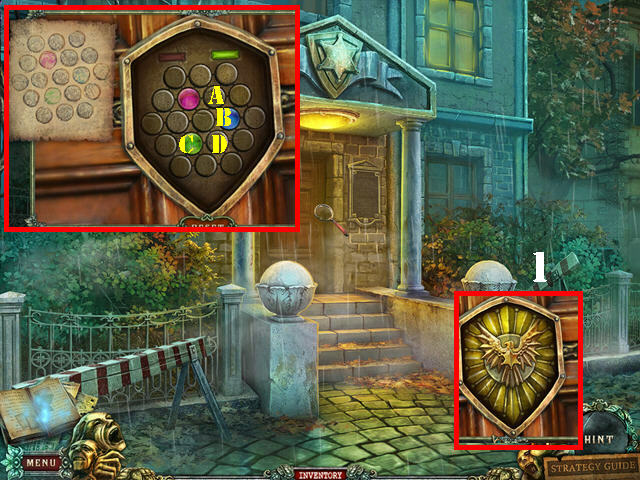 Examine the door; put the GREEN KEY on the lock to activate a puzzle. Your goal is to place the keys next to their matching slots. Use the arrows on the slider to switch the keys. To solve the puzzle, switch the keys in this order: Grab D, E and place them in F, G. Grab A, B and place them in D, E. Grab E, F, and put them in A, B. Your red and white keys should now be in the first two slots. Grab G, H and put them in E, F. Grab C, D and put them in G, H. Put the keys on the slider in C, D. Grab G, H and put them in C, D. Grab D, E and put them in G, H. Grab F, G and put them in C, D. Your blue and yellow keys should now be in the 3rd and 4th slots. Put the green and black keys in spots F, G to complete the puzzle. Open the door to trigger a HOS. Take the key (2) and place it on the lock on the locker; take the open lock. Open the locker; take the ball (3). Open the suitcase. Put the coffee (4) into the mug (5); take the mug with coffee. The POCKET KNIFE will be added to inventory. Walk down and head towards the archive (center building). Zoom into the rain spout; cut the wires with the POCKET KNIFE 4 times and take the TORN BELT (A). Zoom into the door; remove the police tape. 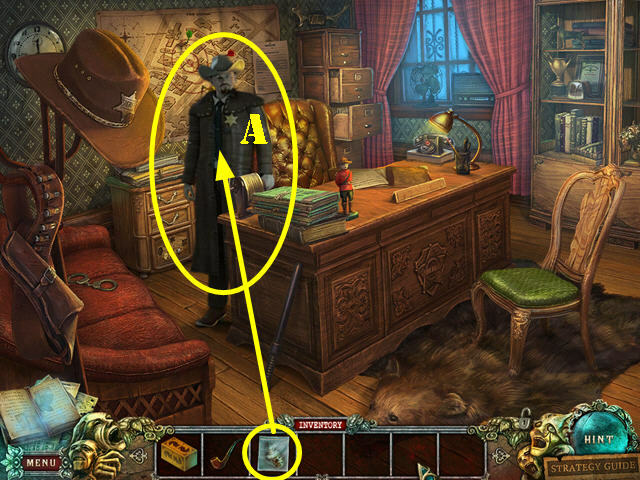 Look at the journal note clue (B). Zoom into the door; remove the 4 screws with the POCKET KNIFE (yellow). 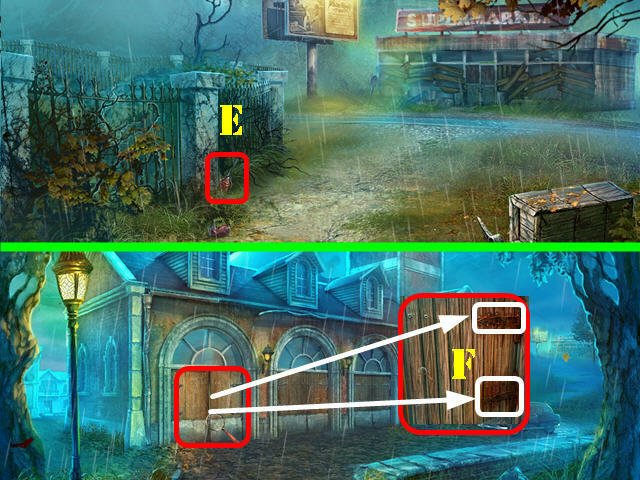 You have to click on the lights in the correct order to solve the puzzle. Please look at the screenshot for the correct order. 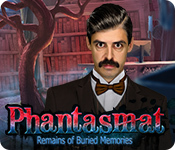 Click on the shaking portrait for the ghost to appear. Click on the printer; take the printed check (1). Click on the tube; take the bowling pin (2). The ELECTRICAL PLUG will be added to inventory. Take the BUCKET HANDLE on the chair (3). Zoom into the projector; put the LENS (4), ELECTRICAL PLUG (5), and the SLIDE (6) into the right spots. Click on the plug hanging down (7). Zoom into the picture; place the WHITE LINEN over it and click on the linen (8). Zoom into the portrait; it’s the same house shown on the projector (A). Use the POCKET KNIFE on the portrait twice. 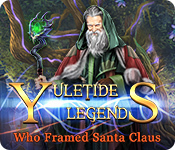 Click on the tear and take the PUZZLE PIECE (B). 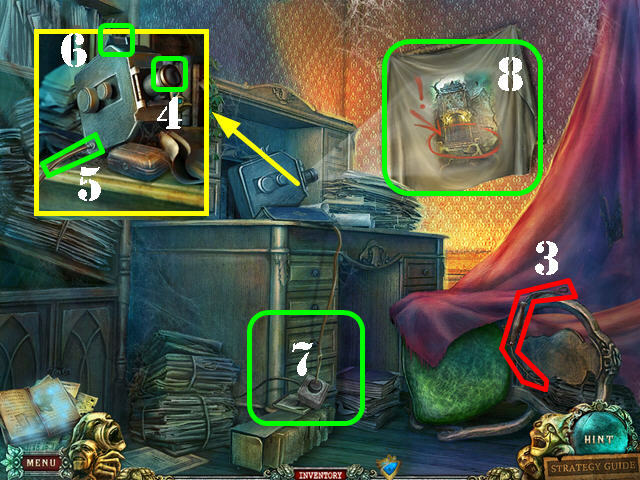 Take a closer look at the wardrobe lock; put the PUZZLE PIECE on it to activate a puzzle. 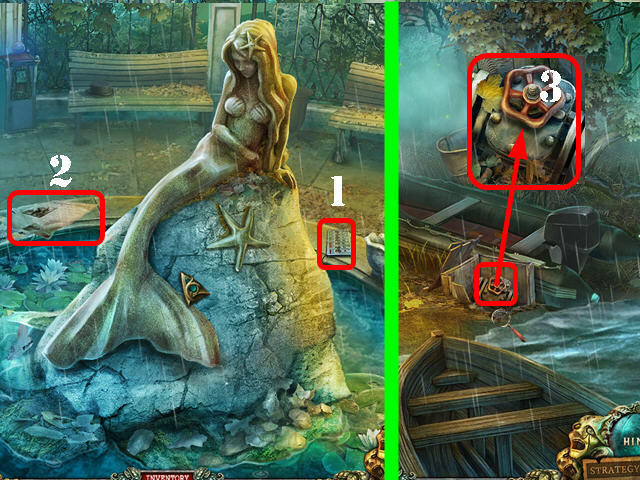 You will receive one puzzle piece at a time; put the pieces into the correct spots. Please look at the screenshot for the solution (C). Click on the knob; zoom into the door and take the KEY CARD (D). 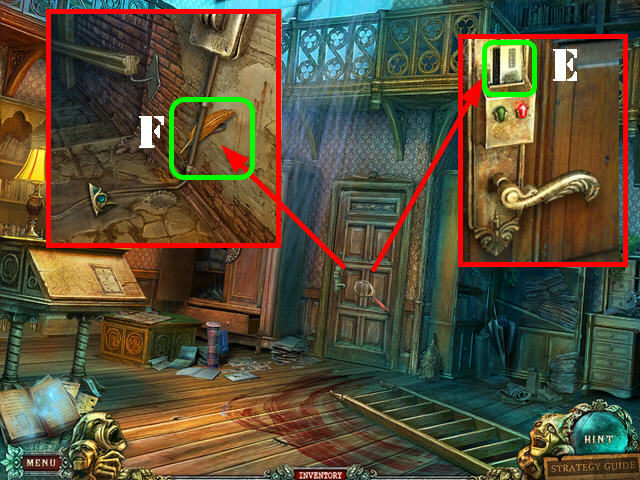 Examine the door; use the KEY CARD in the lock (E). Click on the key card; open the door and look in it. Take the GOLDEN QUILL (F). Click on the shoe (G); take the bootprint (H). Use the brush (I); on the board twice and take the 3 (J). The MOP HANDLE will be added to inventory. 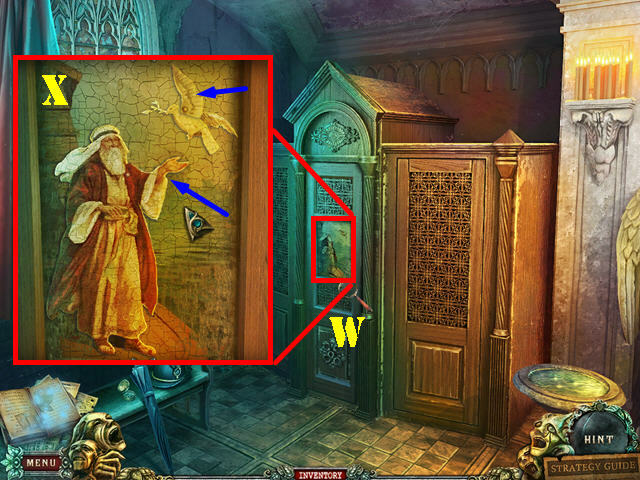 Examine the shelf; put the GOLDEN QUILL (K) in the holder and take the KEY (L). Return to the guard’s hut. 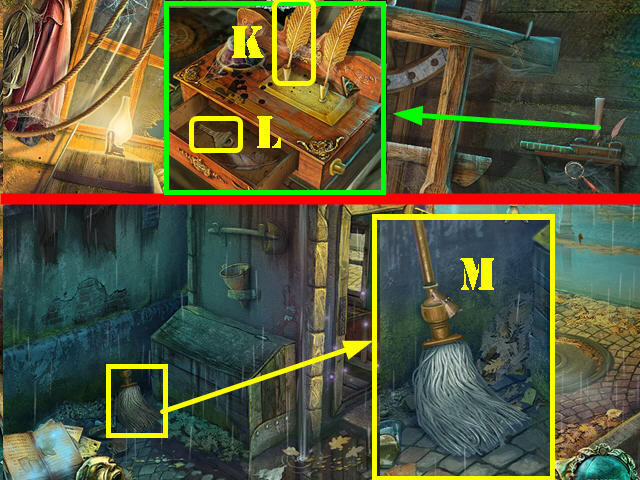 Zoom into the mop head; attach the MOP HANDLE to it and take the MOP (M). Open the locker door; take the brush (N). Cut the cord with the scissors (O); take the handset (P). The STAPLER will be added to inventory. Return to the inside of the archive. Use the MOP on the water 2 times. Click on the left wire and put the INSULATING TAPE on the wires (Q). 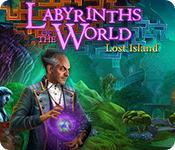 Click on the switch (R) and go through the door. Open the safe door; take the knife (S) and the fork (T). Click on the oil can (U) and then on the oil stain (V). The WOOD BOARD will be added to inventory. Examine the bucket; add the BUCKET HANDLE to it (1). Place the PITCH in the gap (2). Put the WOOD BOARD in the gap. 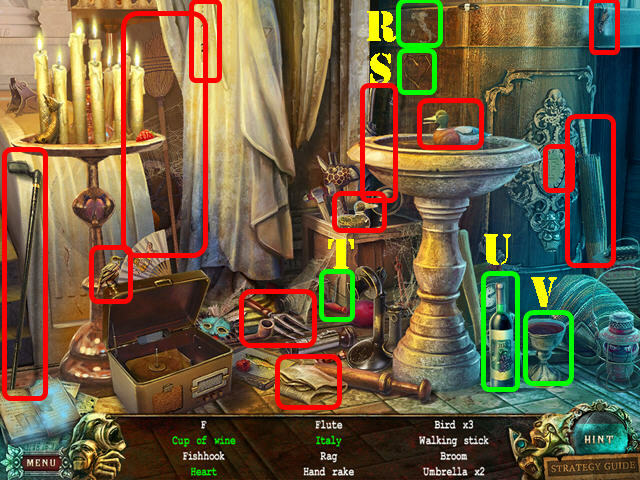 Look at and take the journal page clue (3). 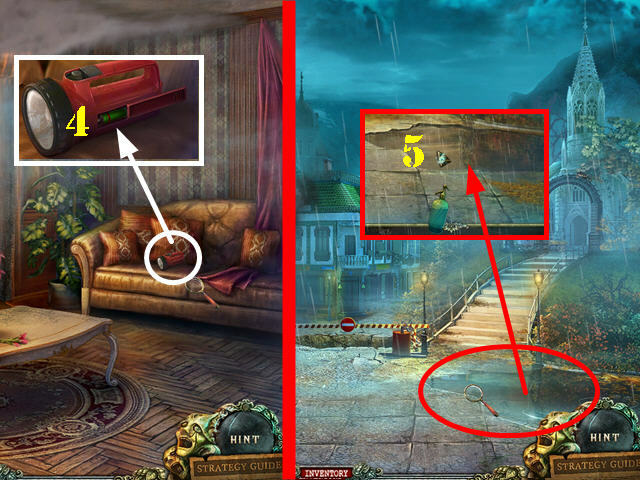 Examine the flask; break it with the HAMMER and take the RED BUTTON (4). Exit the archive and head left to reach the dock. 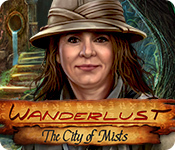 Click on the mayor (A); he takes off on the boat. 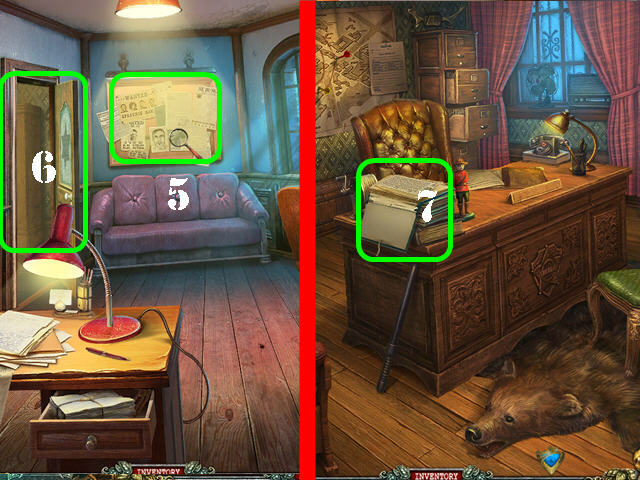 Take the journal page clue in the camera (B). Examine the boat; cut the net with the POCKET KNIFE 3 times. Click on the oar (C). Use the BUCKET in the boat 4 times to remove the excess water. Take the POLICE SIGN PIECE (D) and click on the oar (E). Zoom into the mechanism; put the KEY in the lock (F). Insert the RED BUTTON into the slot (G). Put the TORN BELT on the mechanism and click on it once (H). Use the STAPLER on the belt. Click on the KEY and then on the red button. Click on the lever (I). Go forward to go across the river. 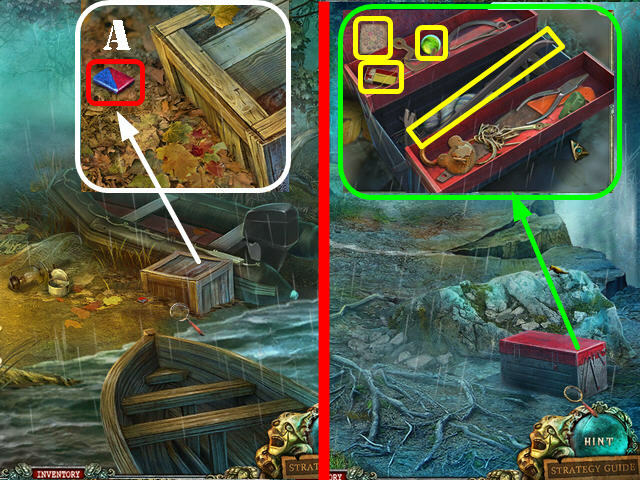 Examine the crate; take the LATCH (A). Examine the toolbox; put the LATCH on the left and open both latches. 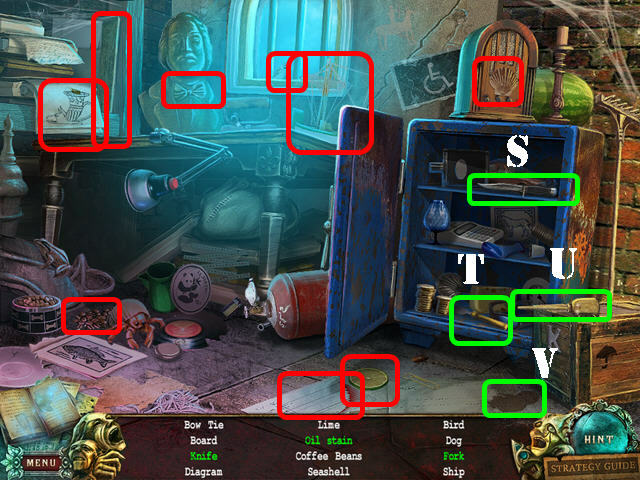 Take the MATCHES, CROWBAR, STRANGE CODE, and BUTTON GREEN (yellow). Open the lid; take the orange (B). Cut the string around the button with the scissors (C); take the button (D). The JUMP ROPE will be added to inventory. Zoom into the broken lamp; put the MATCHES in it; take the LIT LAMP (E). Zoom into the crate; use the CROWBAR on it twice and take the BOARDS (F). Go forward; look through the doorway and place the LIT LAMP inside (G). Put the BOARDS on the ground (H). Use the JUMP ROPE on the boards and go forward. 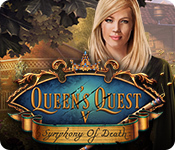 Click on the police officer to trigger a HOS; play it. Open the box and take the paintbrush (I). The POLICE SIGN PIECE will be added to inventory. Return to the center of town and head right. Go towards the police station on the left. 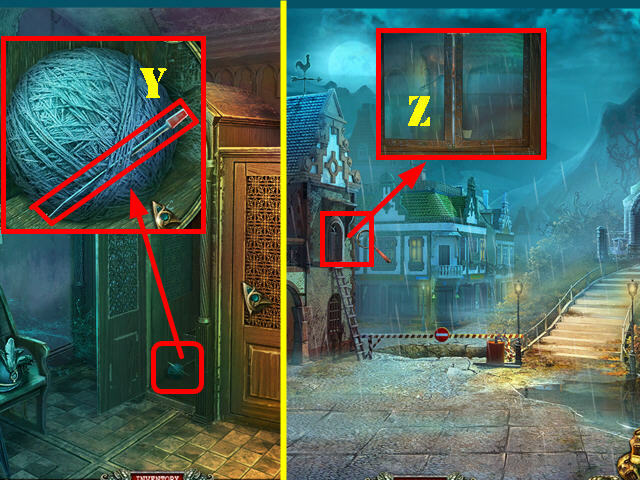 Zoom into the door; put the 2 POLICE SIGN PIECES in the slot (1). 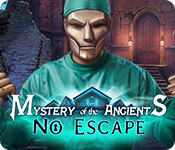 Click on the sign to reveal a puzzle; put the STRANGE CODE on the side of the lock. 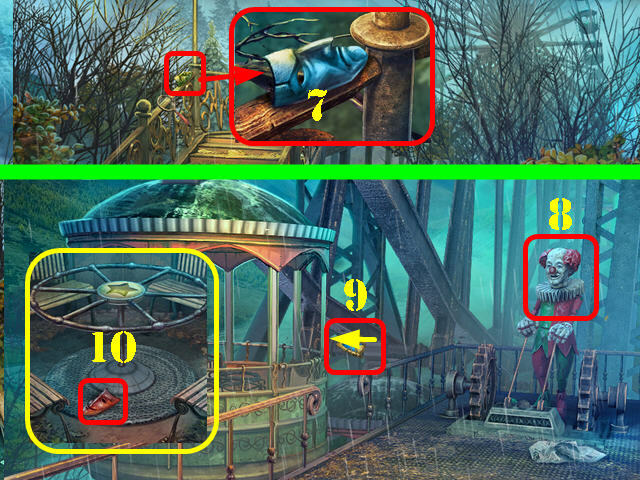 Put the BUTTON GREEN on the lock to activate the puzzle. 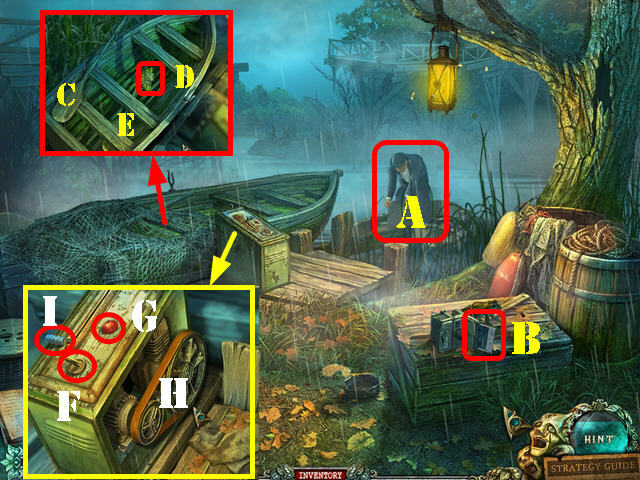 To solve the puzzle, click on the buttons in this order: B x 5, A x 4, C x 5, A x 2, D x 3, and A x 3. Open the door and go through it. Remove the cloth; take the moon (2). Drag the fingerprint (3) to the card (4); take the fingerprints. The POKER will be added to inventory. 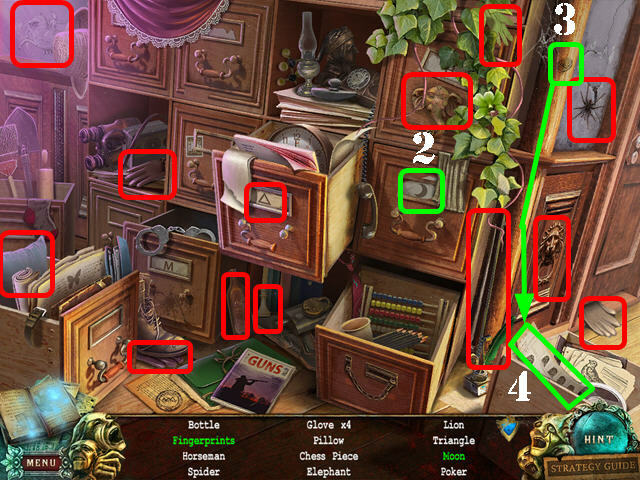 Click on the bulletin board to add a journal page clue (5). Open the left door and go through it (6). 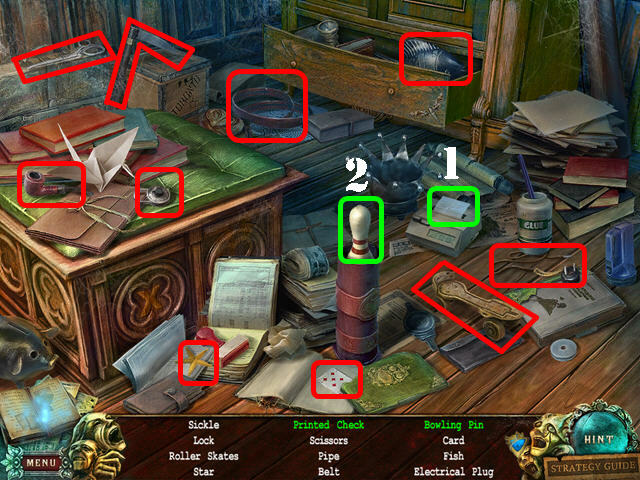 Look at the stack of notes on the desk (7); take the journal page clue. Go back into the archive and go through the door. 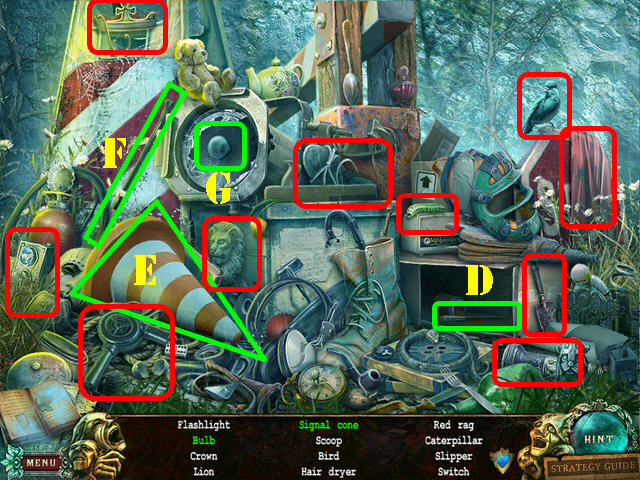 Click on the lamp (8); take the magnet (A) and the giraffe (B). Drag the deflated balloon (C) to the tank; click on the tank and take the balloon (D). Cut the sack with the knife (E); take the apple (F). The SPEAKER will be added to inventory. Examine and open the oven door. Use the POKER in the oven and take the POLICE BADGE (G). Put glue (H) on the book (I) 3 times. Drag the cover (J) to the book and take the green book. Click on the paper 3 times; take the ship (K). Return to the police station and go into the office on the left. 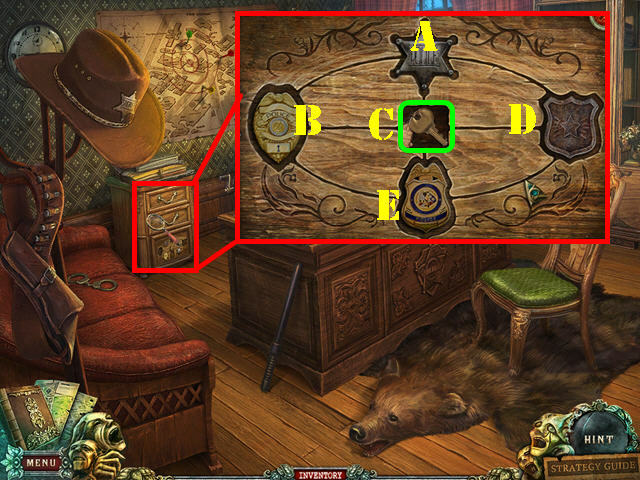 Examine the cabinet and put the POLICE BADGE on it to activate a puzzle. Put the badges into the right slots. 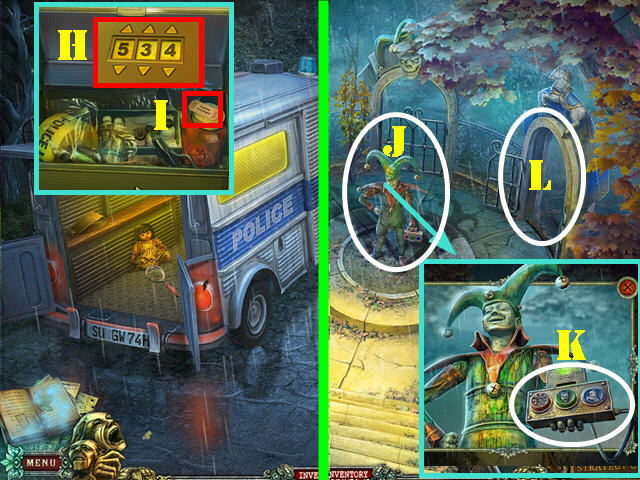 To solve the puzzle, click on the badges in this order: B, E, C, A, B, C, D, E, C, B, E, and C.
Take the KEY FROM A POLICE VAN (green). Take the boat back to the other side of the river and go forward. Drag the deflated tire (1) to the pump (2); click on the pump twice and take the tire (3). Click on the branches (4); take the pinecone (5). The WALKIE-TALKIE COVER will be added to inventory. 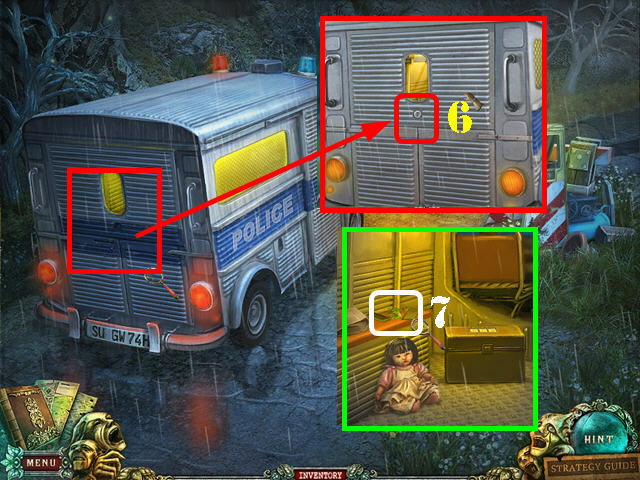 Examine the back of the van; use the KEY FROM A POLICE VAN in the lock (6). Click on the lock and open the 2 parts of the back door. 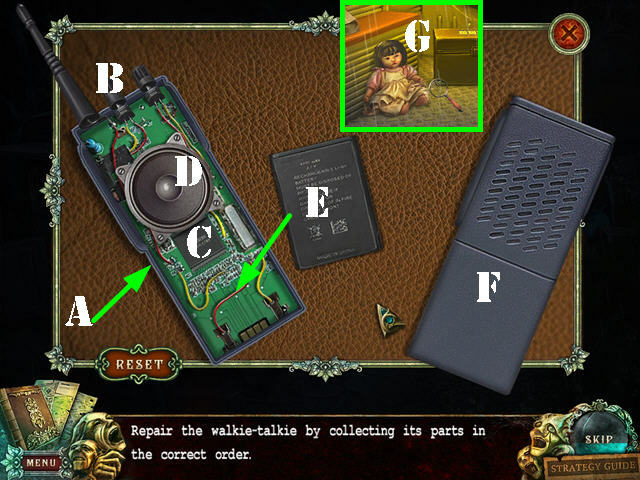 Examine the broken walkie-talkie (7). Put the SPEAKER and the WALKIE-TALKIE COVER next to the other parts. Place the motherboard on the left piece (A). Place the antenna above the left piece (B). Put the processor as shown (C). Put the wires over the motherboard and then put the SPEAKER (D) on. Put the battery (E) at the bottom and place the WALKIE-TALKIE COVER on (F). 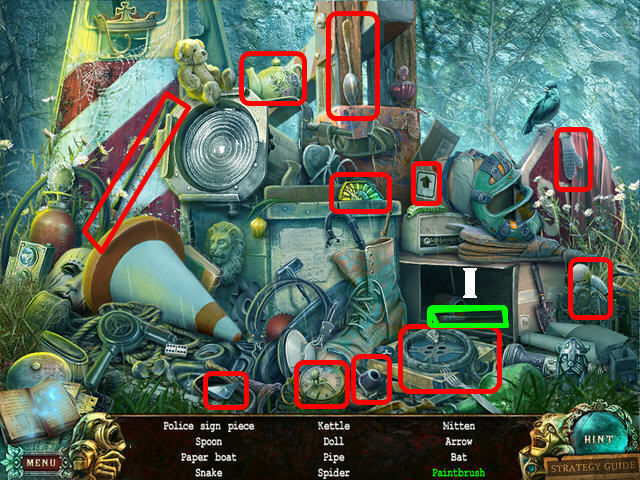 Click on the doll (G). 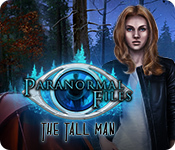 Give the WALKIE-TALKIE to the doll. 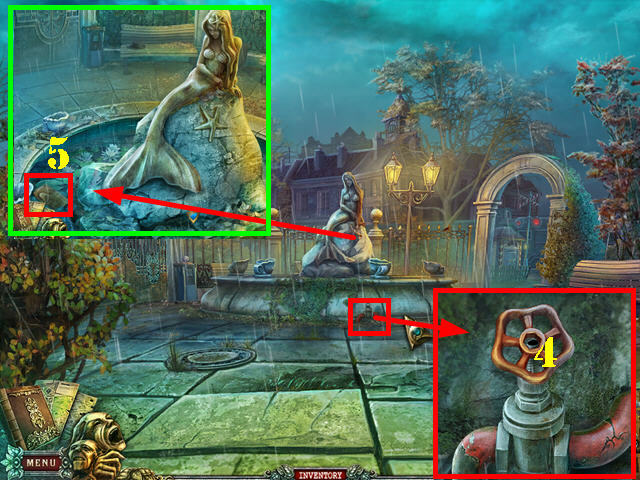 Zoom into the fountain; take the CODE LABEL (1). 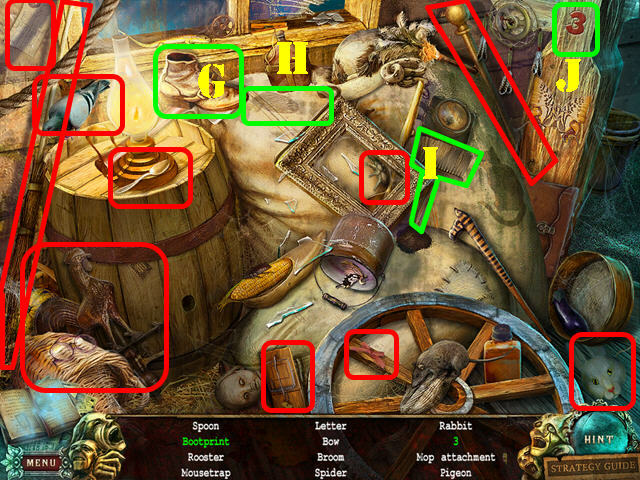 Look at and take the journal page clue (2). Zoom into the valve (3); use the WRENCH on the VALVE 3 times and take it. Go back to the fountain. 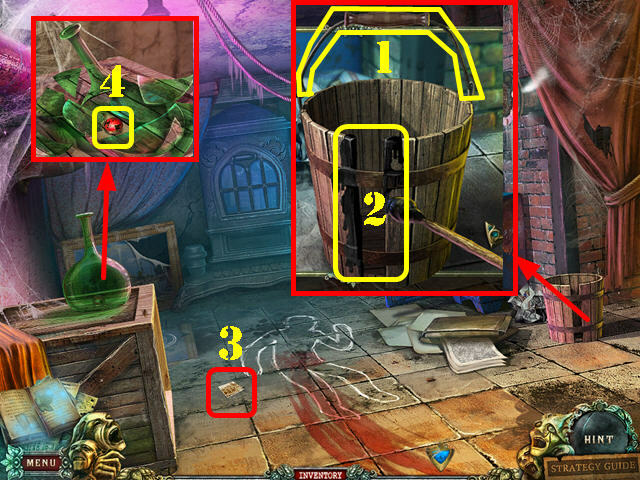 Examine the tap; put the VALVE on it (4). Zoom into the fountain; take the OVEN MITT (5). Click down; go right and go into the train. Click on the lever (6); put the OVEN MITT into the oven (7) to receive the TRAIN CAR LEVER. Exit the train and zoom into the undercarriage (8). 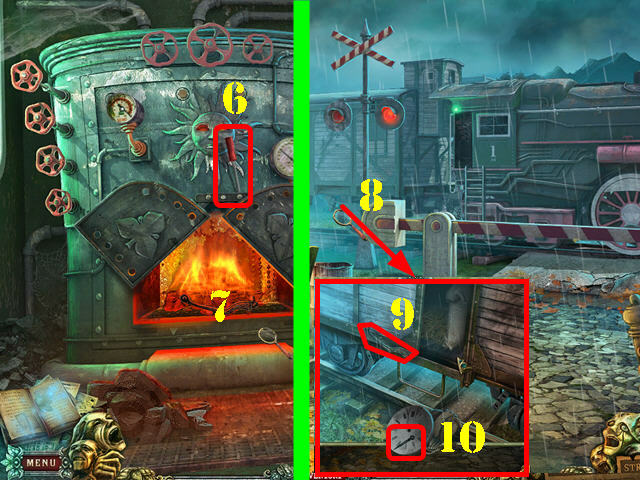 Use the TRAIN CAR LEVER on the door and click on it (9); take the DIAL NEEDLE (10). Go back into the train. 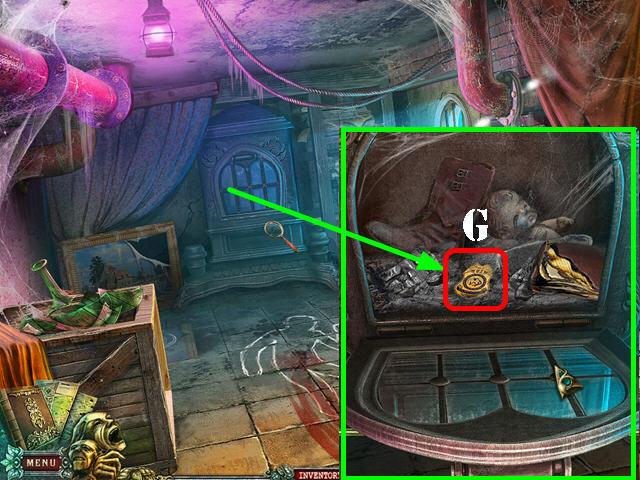 Zoom into the mechanism; put the DIAL NEEDLE on the thermostat (A) to activate a puzzle. You have to click on the levers in the correct order so that the boiler does not overheat. 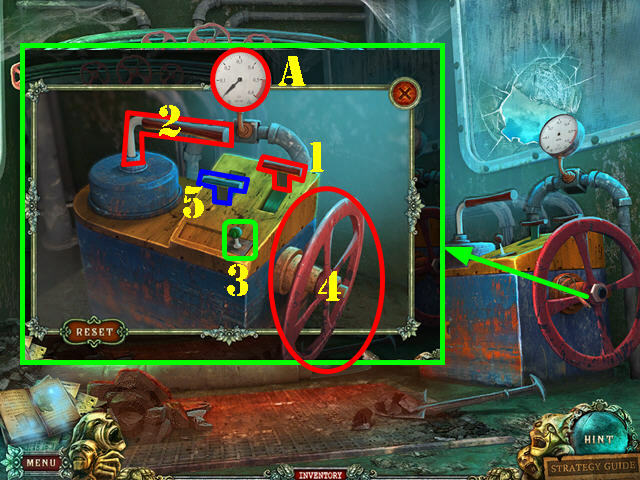 Solution: Red lever (1) Large Lever (2), Green Lever (3), Valve (4), and Blue Lever (5). Go forward down the path after the train moves. Use the scraper (A) on the wall; take the COCKROACH (B). Open the tin can with the can opener (C); take the open tin (D). The RECEIPT ROLL will be added to inventory. Zoom into the left door; use the OILER on the 2 rusty hinges (F). Open the door and go through it to access the fire station. Take the SAD MASK 1/2 (G). 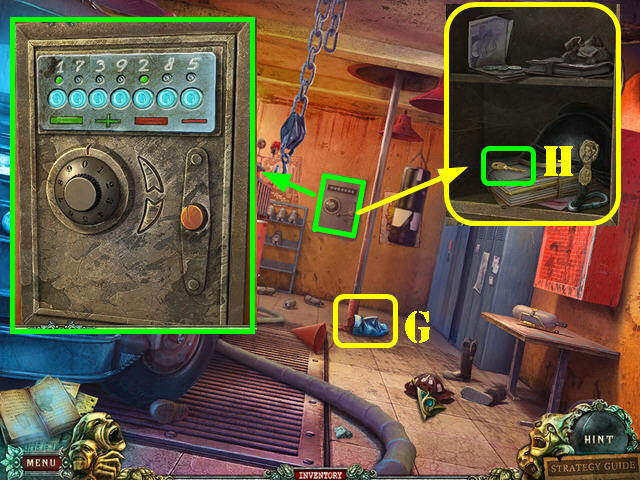 Zoom into the safe; put the CODE LABEL on it to activate a puzzle (). To obtain the solution, you must first decipher the equations. 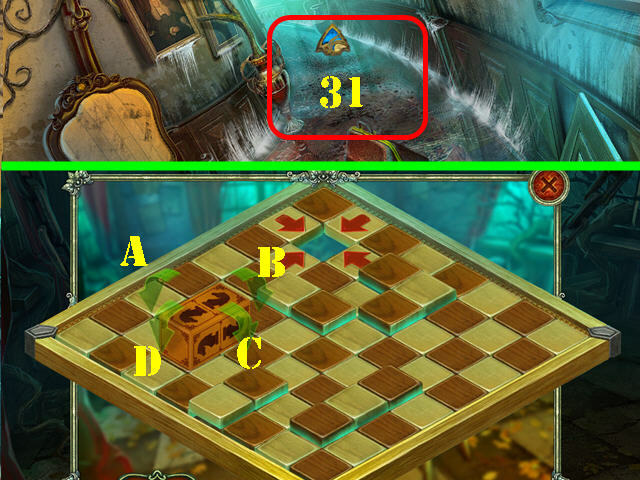 Use the numbers that light up on the dial as a clue. If both numbers are green, add them both up. If one number is red, subtract the numbers. First: 1 + 2 = 3, Second: 3 minus 2 = 1, Third: 3 + 5 = 8, Fourth: 1 + 3 = 4, Fifth: 9 minus 2 = 7, Sixth: 8 minus 3 = 5, and Seventh: 1 + 7 = 8. 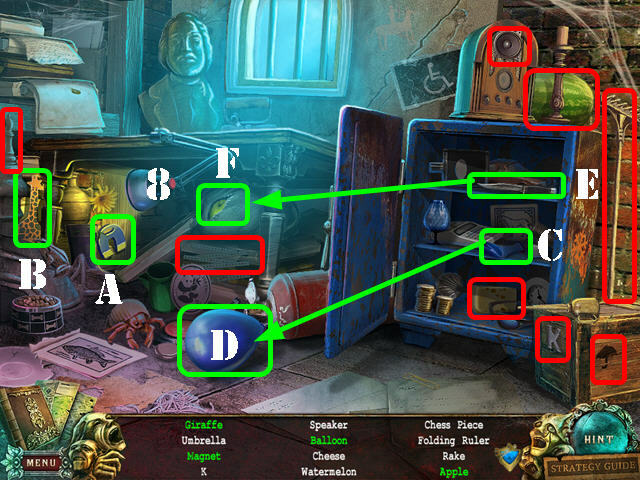 You must turn the dial (using the arrows) to the result of each equation and click on the red button for each result. Take the SUPERMARKET KEY (H) from inside the safe. Exit the fire station; go right and zoom into the supermarket door. Use the SUPERMARKET KEY in the lock (I). Open the door and enter the supermarket. Remove the leaf in the lower right; take the orange (J) and place it on the scale; take the 350 (K). Remove the cloth; take the bottle (L). The NAIL SCISSORS will be added to inventory. Take the EMPTY SACK (M). Zoom into the cash register; open the lid and put the RECEIPT ROLL in it (N). Close the lid and click on the handle (O) to open the drawer. 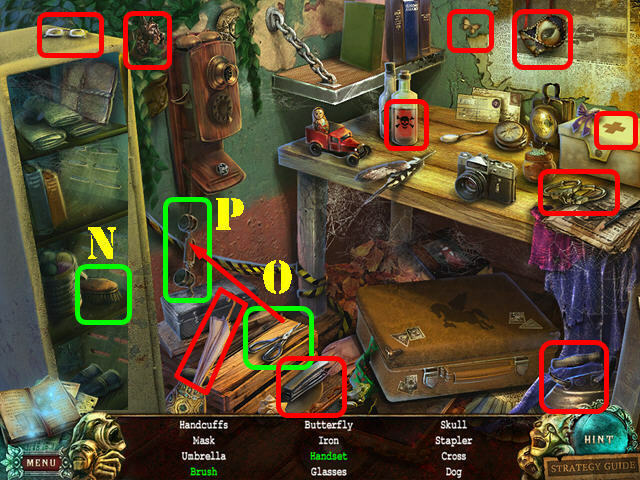 Take the HANDFUL OF COINS (P) and the journal page clue (Q). Open the left door (R) and go through it. Zoom into the carpet (S); cut it with the NAIL SCISSORS and click on the cut carpet. Remove the nails with the CROWBAR by clicking on each nail twice. 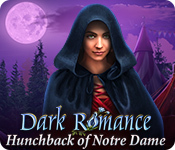 Click on the board; take the HAPPY MASK 1/2 (T) and the KNIGHT (U). Go back to the outside of the fire station. 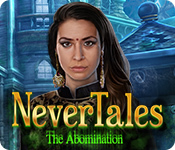 Click on the book page; take the coin (V). Drag the globe (W) to the stand (X); take the globe. The ROBOT HAND will be added to inventory. Walk down twice and head left. 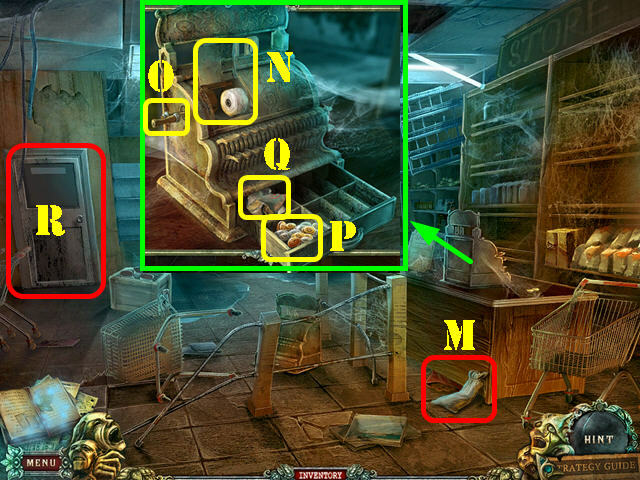 Examine the machine; use the HANDFUL OF COINS in the slots (Y) to activate a puzzle. 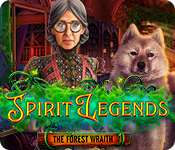 Put 4 coins into the slots that add up to fifty-five cents: add 25, 10, 10, and 10. Go through the gate to access the amusement park. 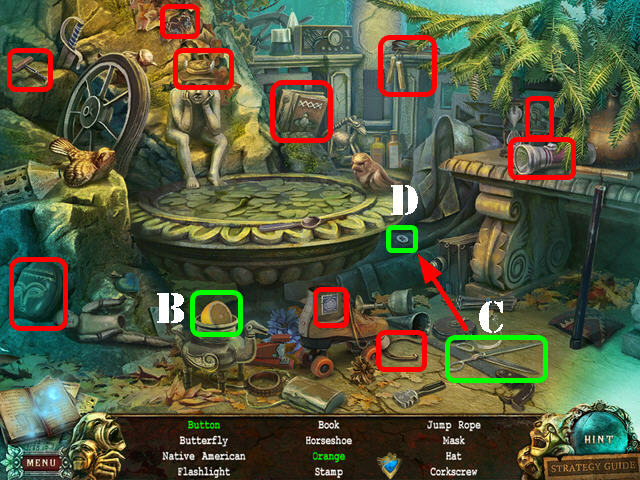 Take the journal page clue (A). 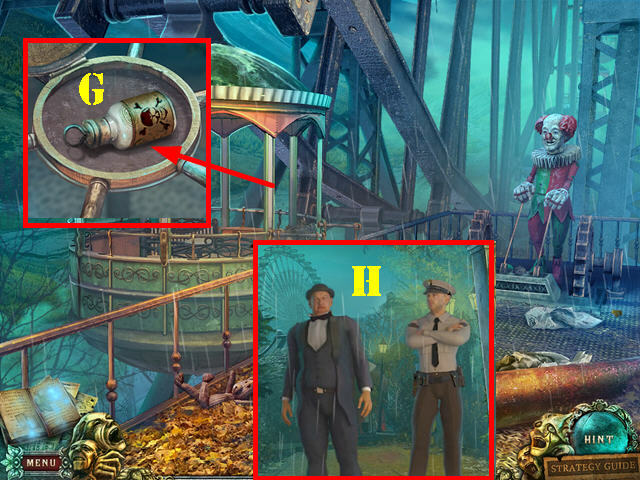 Examine the mechanical monkey; zoom into it and click on the loose arm. Put the OILER on the 2 bolts (B). 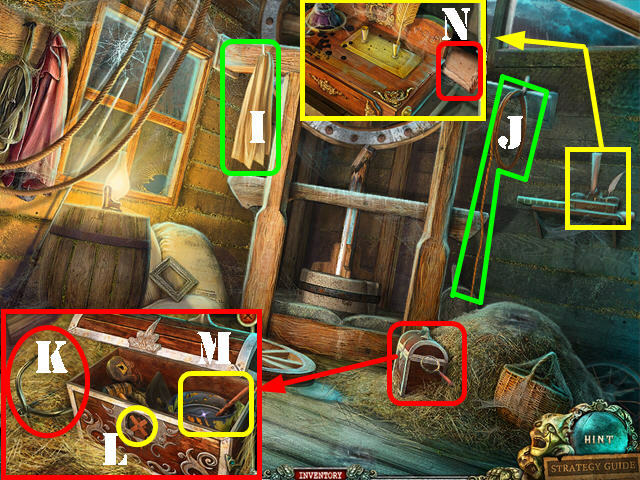 Tighten the bolts with the WRENCH and take the journal page clue (C). Put the paintbrush (D) on the cone (E) 2 times; take the signal cone. Use the bat (F) on the light 2 times; take the BULB (G). The SWITCH will be added to inventory. Examine the back of the van. Zoom into the locked box; enter the numbers 534 on the dials (H). Take the TICKET from inside the box (I). Go back to the amusement park and go through the welcome archway. 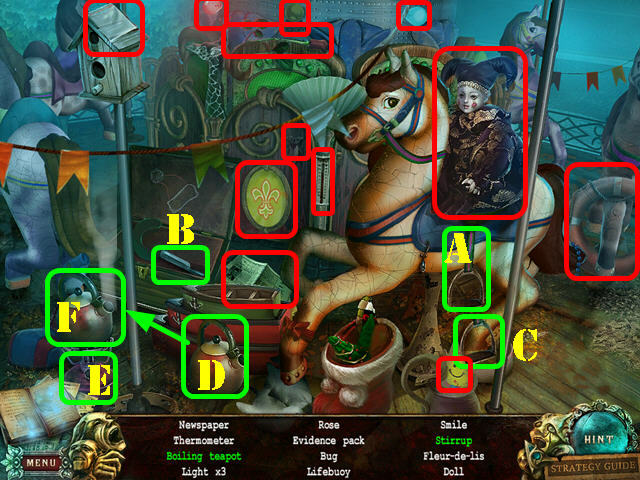 Zoom into the jester (J); put the ROBOT HAND on its arm. Put the SWITCH in the hand (K). 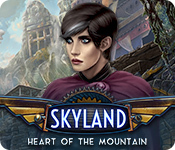 Use the TICKET in the slot and click on the blue button to open the right gate. 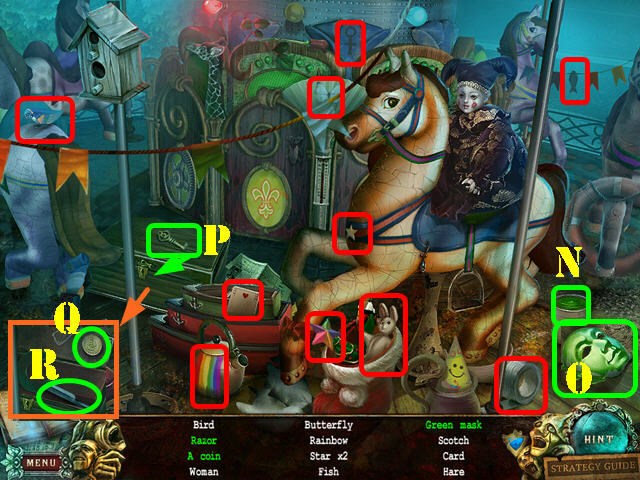 Go through the right gate to access the carousel (L). Pour the paint can (N) on the mask; take the green mask (O). Open the lock with the key (P); take the coin (Q) and the razor (R). The COIN will be added to inventory. 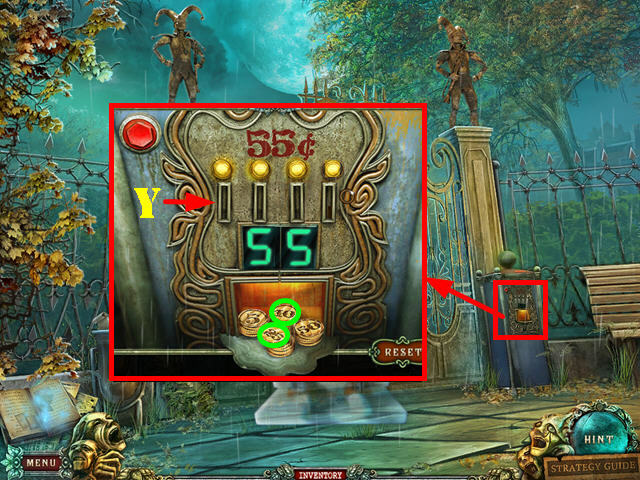 Zoom into the machine; use the COIN in the slot (1). 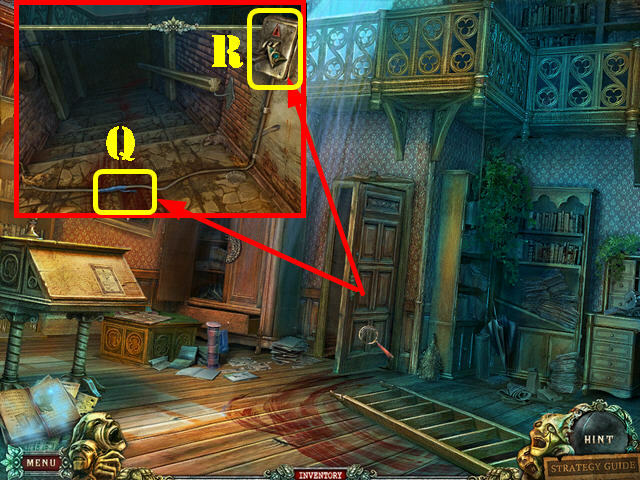 Click on the coin; pull the lever (2) and click on the red button (3). Take the SEVERAL BALLS (4). 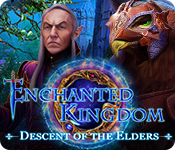 Go back to the jester; zoom into it and click on the blue button (if it isn’t already down). Go right to the carousel. 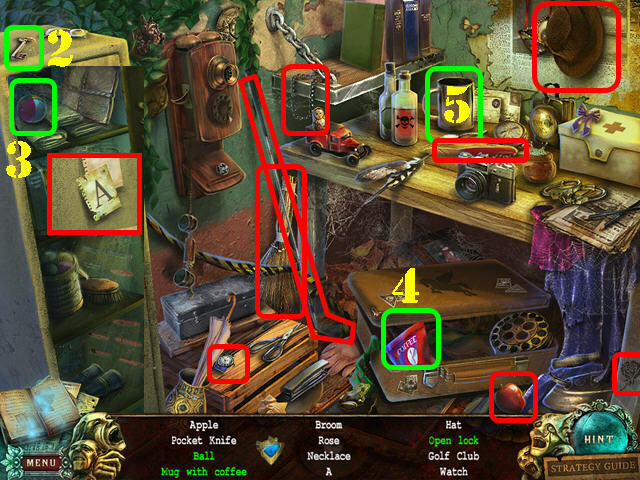 Examine the booth; put the SEVERAL BALLS down (5). 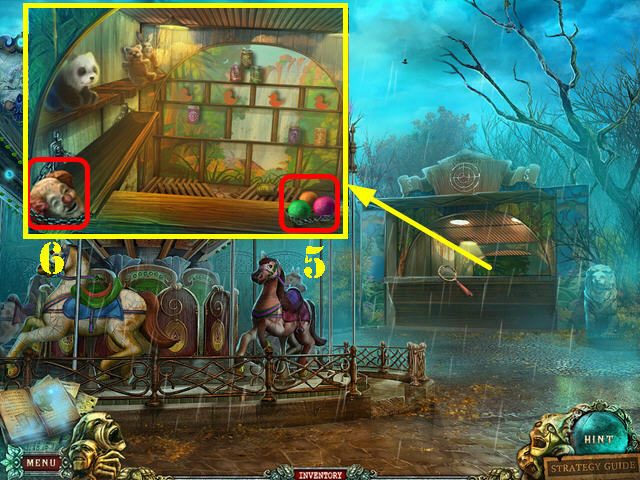 Click on the 3 balls and take the CLOWN’S HEAD (6). 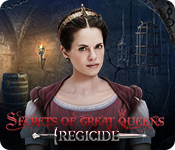 Go back to the jester; click on the red button to unlock the left gate. Go through the left gate to access the Ferry wheel. Zoom into the railing; take the 2/2 SAD MASK (7). Put the CLOWN’S HEAD on the clown body (8). Go into the Ferris wheel (9). Open the door and take the HAPPY MASK 2/2 (10). 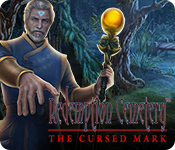 Go back to the jester and click on the green button to unlock the center gate. 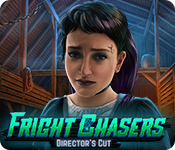 Go through the center gate to access the horror room. 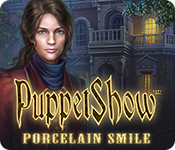 Place the 2 SAD MASK pieces on the right jester’s face (11). 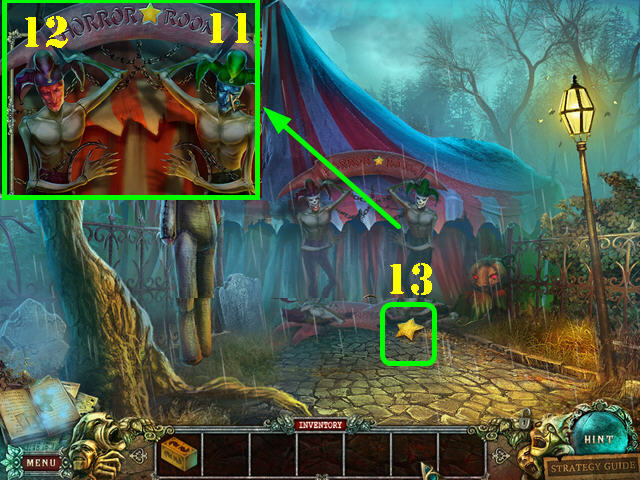 Place the 2 HAPPY MASK pieces on the left jester’s face (12). Take the STAR-SHAPED KEY (13). Go back to the gondola inside of the Ferris wheel. 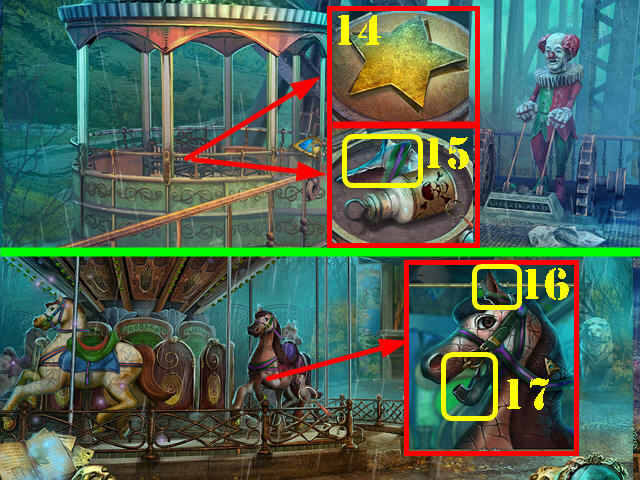 Zoom into the center and put the STAR-SHAPED KEY into the slot (14). Open the cover and take the HORSE’S EAR (15). Go back to the carousel. Examine the right horse; put the HORSE’S EAR on its head (16) and take the PIPE (17). Cut the strap around the stirrup (A) with the razor (B) and take the stirrup (C). Put the teapot (D) on the burner (E); click on the burner and take the boiling teapot (F). The EVIDENCE PACK will be added to inventory. Go back to the Ferris wheel; zoom into the wheel in the gondola. 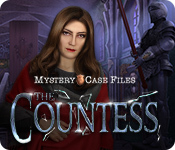 Use the EVIDENCE PACK to grab the MURDERER’S FINGERPRINT (G). 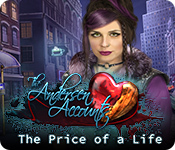 Walk down until you reach a cut scene (H); you will be automatically transported to the police station. Talk to the sheriff (A). Give the MURDERER’S FINGERPRINT to the sheriff. Turn the magazine page 4 times; take the revolver (B). Use the quill (C) on the paper; take the blot (D). The TRUCK HOOK will be added to inventory. Walk down twice; go forward and head towards the church. Take the EMPTY GAS CAN (E). Zoom into the container; put the EMPTY GAS CAN on the ground (F). Click on the handle (G); take the FULL GAS CAN. Go towards the church and zoom into the truck. Open the gas cap and put the FULL GAS CAN into it (H). Put the TRUCK HOOK on the rope (I). Click on the levers (J); open the back door and go through it. Go towards the altar once inside the church. Drag the record (K) to the player (L); take the music notes (M). 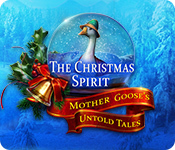 The MUSIC SHEET will be added to inventory. Click down and zoom into the organ on the right. 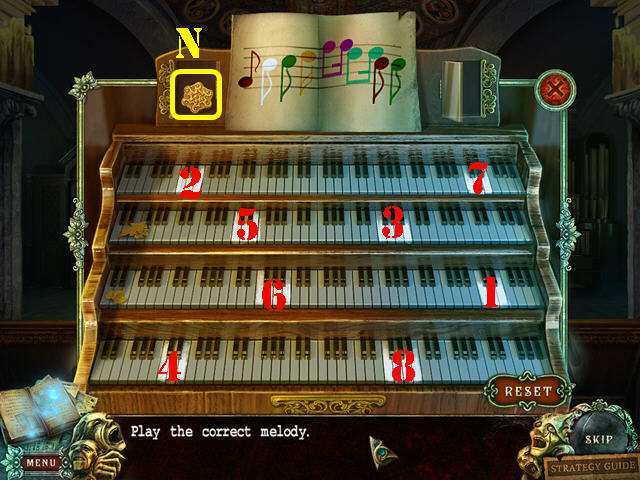 Put the MUSIC SHEET on the organ to activate a puzzle. Reproduce the sequence on the sheet music. 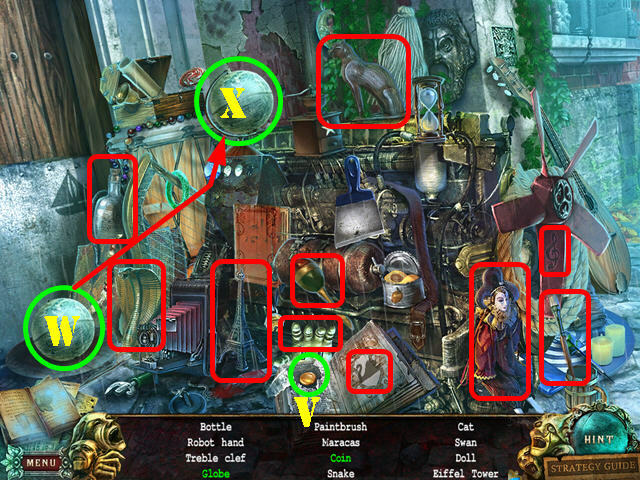 Please look at the screenshot for the solution and click on the keys in the order shown. 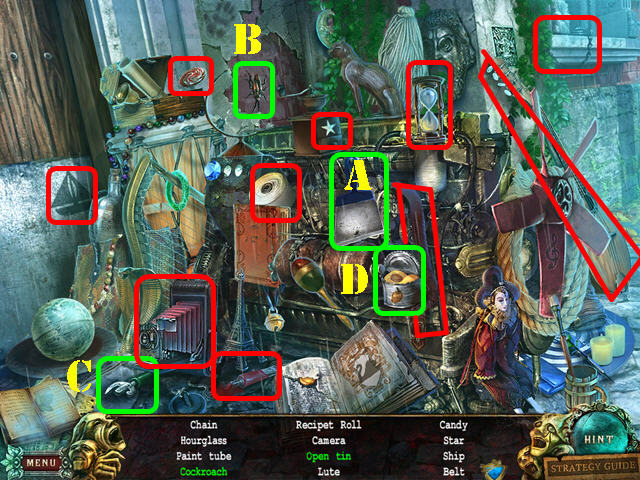 Examine the podium; take the BATTERY (O). 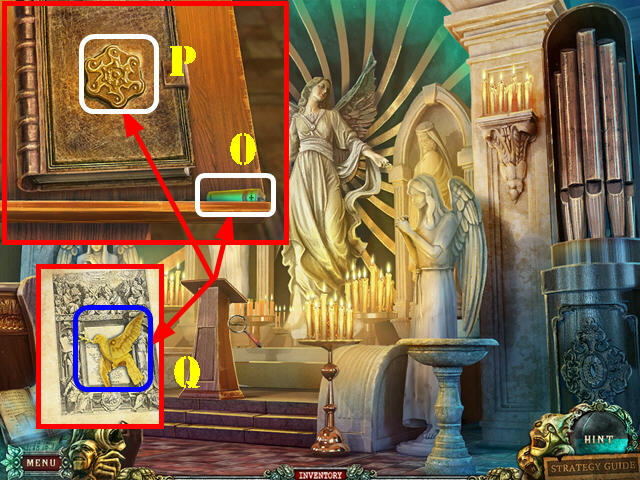 Put the SYMBOL on the book (P). Open the curtain; take Italy (R) and the heart (S). Use the corkscrew (T) on the bottle (U); pour the wine in the glass and take the cup of wine (V). The RAG will be added to inventory. Zoom into the dirty picture (W); wipe it with the RAG 3 times. Put the DOVE on the picture to activate a puzzle. 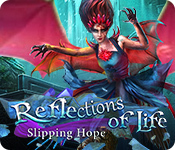 Position the images in the correct positions by clicking on the arm and the wing (blue arrows). Please look at the screenshot for the solution (X). 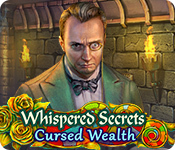 Talk to the juror that comes out of the confessional. Examine the confessional; take the NEEDLE (Y). Exit the church and walk down twice. Look at the window; use the NEEDLE on the window and go into it (Z). Move the cloth; take the crown (1) and the rider (2). Click on the paper 4 times; take the paper crane (3). The EMPTY SIPHON will be added to inventory. Take a closer look at the couch. Open the battery cover; insert the BATTERY in the flashlight (4). Close the cover and take the FLASHLIGHT. Zoom into the puddle in the lower right; put the EMPTY SIPHON in the water to obtain the FULL SIPHON (5). Open the box and take the lock (6). Drag the leg (7) to the bear (8); use the needle and thread (9) on the leg. Take the bear. The WOMAN’S SHOE will be added to inventory. Use the FULL SIPHON on the fire to extinguish it (10). 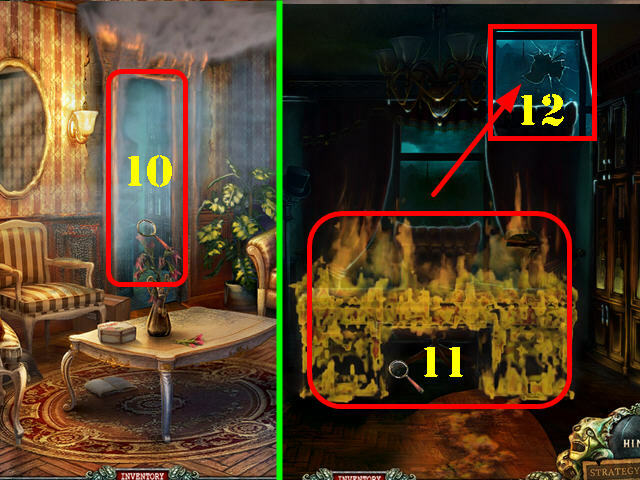 Use the FULL SIPHON to extinguish the desk fire (11). Break the window with the WOMAN’S SHOE (12). 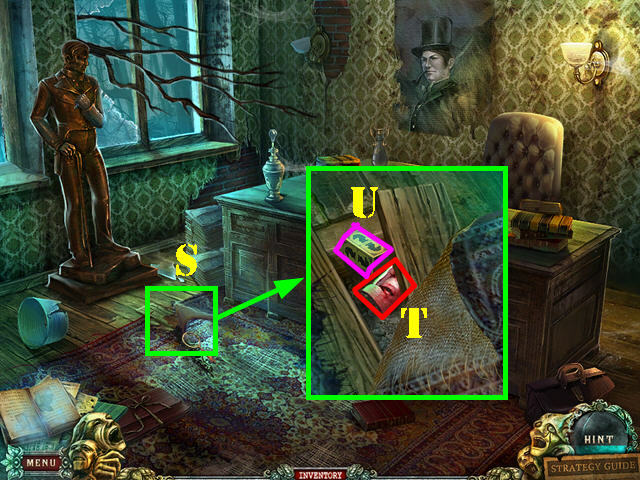 Use the FLASHLIGHT on the scene; click on the lamp’s chain (13). 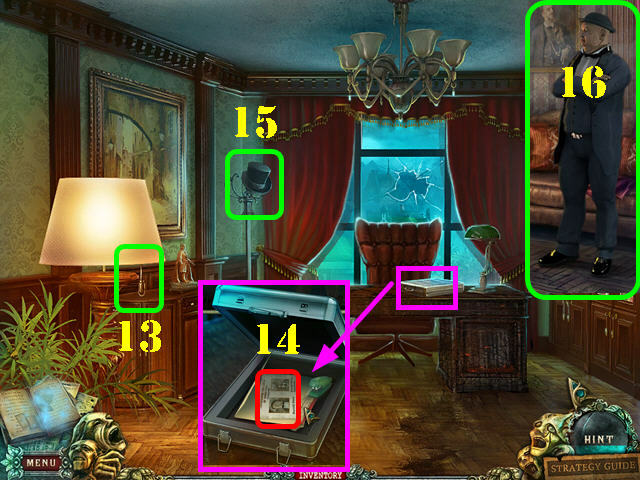 Open the briefcase; open the folder and take the journal page clue (14). Take the TOP HAT (15). Talk to the mayor (16). Take the boat back to the other side of the river. 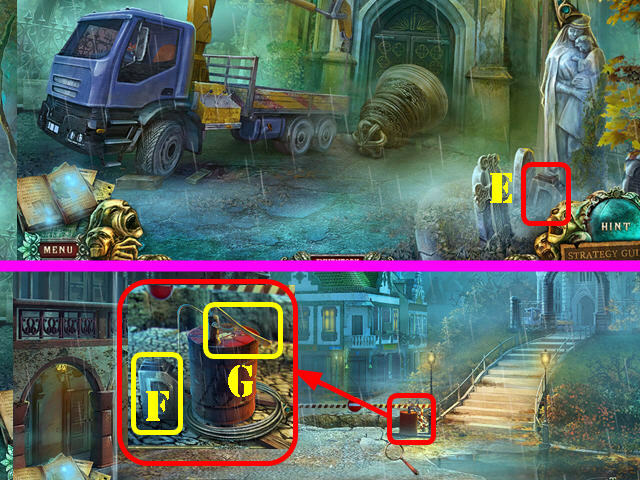 Return to the fire station and head right for a cut scene to appear. Click on the toaster handle; take the toast (17). The GARDEN SHEARS will be added to inventory. Go into the office in the supermarket. 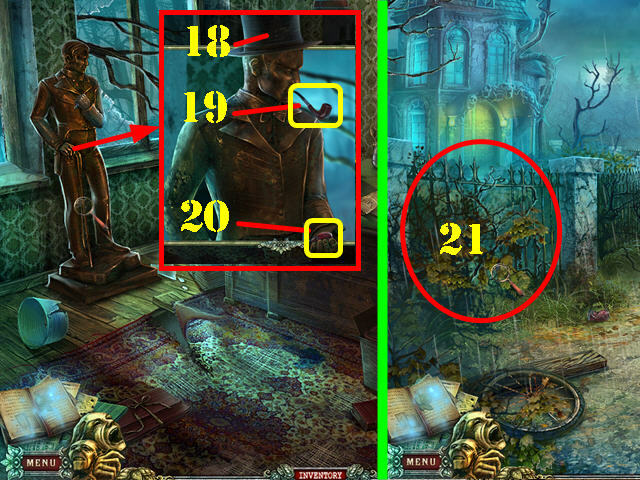 Examine the statue; put the TOP HAT (18) on the head and the PIPE (19) in its mouth. Examine the bushes (21); use the GARDEN SHEARS on them and go through the gate. 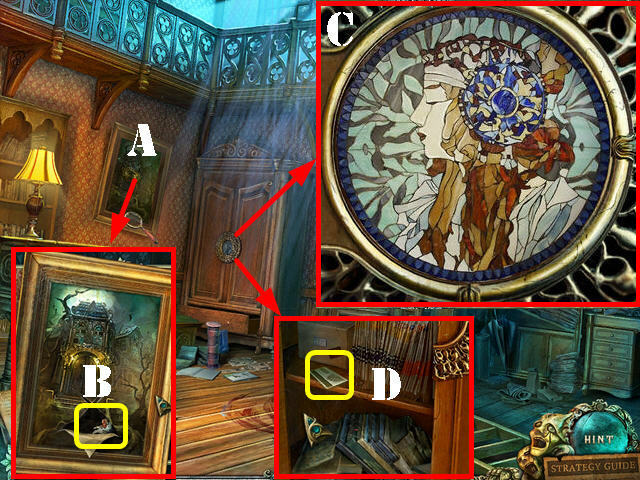 Zoom into the door; put JEAN’S BLOOD on the door to activate a puzzle. Click on the rings until the right image is formed. To solve the puzzle, click on the rings in this order: A x 4, E x 4, B x 5, C x 5, and D x 2. 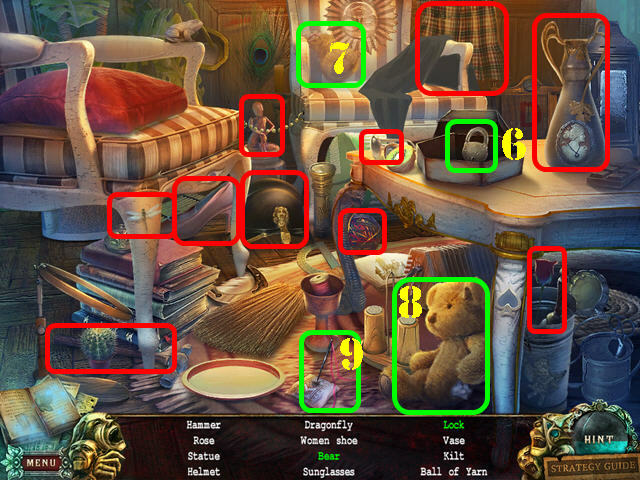 Click on the pearl necklace (22); take the 6 pearls are marked in yellow. 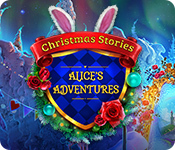 Drag the lipstick (23) to the mirror; click on Alice (24). The SAW will be added to inventory. Open the back door and go through it. 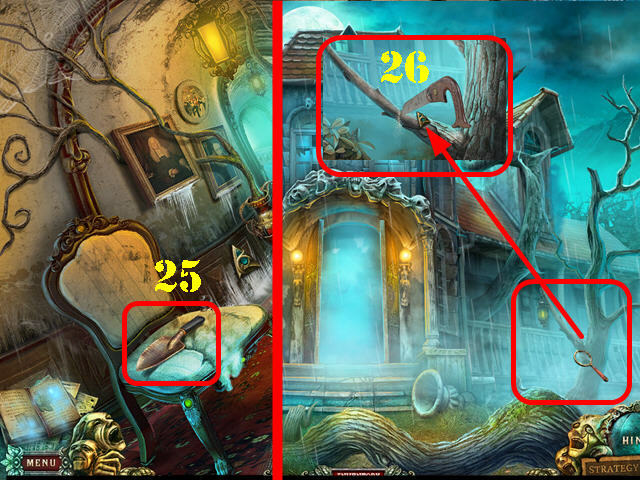 Zoom into the tree branch; use the SAW on it to obtain the STICK (26). 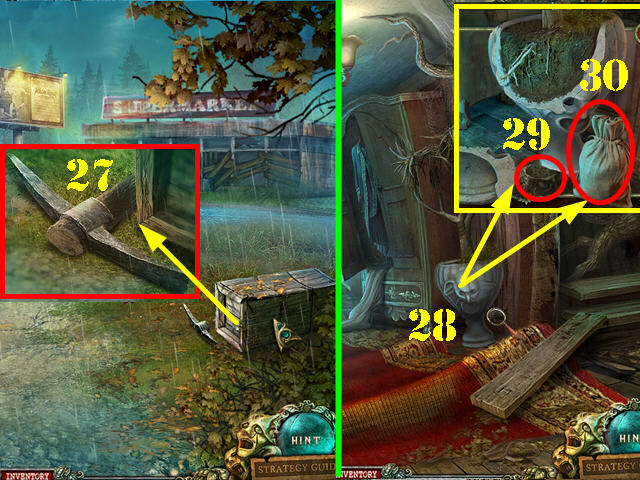 Zoom into the crate; use the STICK on the axe head; take the PICKAXE (27). Go back inside the mansion. 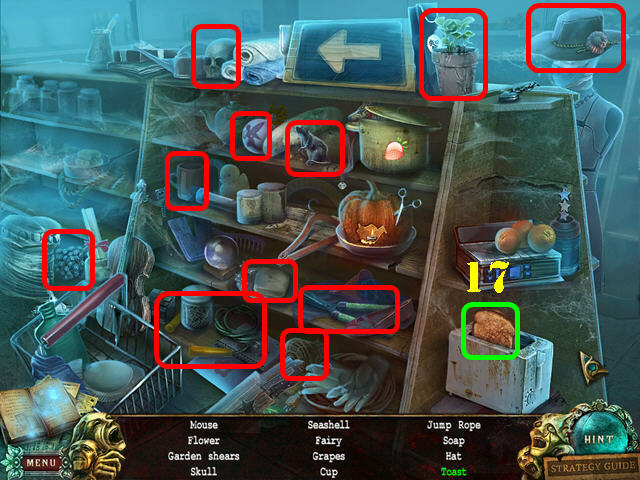 Zoom into the potted plant (28); break the pot with the PICKAXE. Put the EMPTY SACK on the ground; use the SHOVEL on the dirt (29) and take the FULL SACK (30). Note: You can pick up the EMPTY SACK in the supermarket if you haven’t done so already. Go through the back door. Put the FULL SACK on the ground and go forward (31). 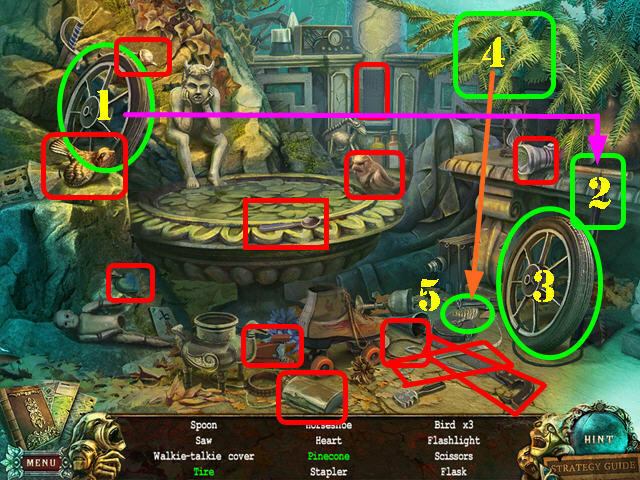 Put the KNIGHT on the board to activate a puzzle. Your goal is to land the knight into the hole with the red arrows. Use the green arrows on the block to move it in the desired direction. To solve the puzzle, click on the arrows in this order: B x 3, A x 2, D, A x 2, D, A, and B x 3. Zoom into the juror’s pocket; take the SCALPEL (A). Zoom into the medical bag; cut it with the SCALPEL and take the LIQUID AMMONIA (B). 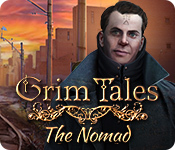 Use the LIQUID AMMONIA on the juror by the window (C) and click on him after he wakes up. Congratulations! 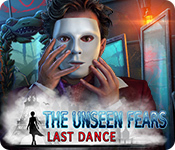 You have completed Fear for Sale: Sunnyvale Standard Edition!